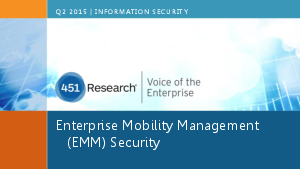 This report details the results of a survey taken from pre-qualified IT decision makers from North America and Europe, and shows how AirWatch by VMware received the highest scores for EMM vendor promise and fulfilment. 950 surveys were completed. 451 Research, the preeminent information technology research and advisory company, has a panel of highly accredited senior IT executives who participate in surveys focused on enterprise IT trends. The panel consists of 12,500+ IT decision-makers in North America and Europe.